Tuesday's presidential swearing in may be a historic, solemn occasion. But this is the U.S., which means that a lot of people are trying to make a buck off the big day. With that in mind, here's a buyer's guide to some of the notable Obama items for sale. 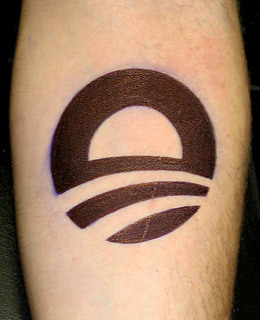 The surest sign of a dedicated Obama supporter is commitment in ink. Fatty's Custom Tattooz in D.C. is offering a free Obama-logo tattoo as part of its "Obamathon" for those who purchase an initial tattoo worth $200 or more. The store is also providing Obama piercings, with a Democratic blue O ring for the upper ear ($44; 1333 Connecticut Ave. NW; www.fattyscustomtattooz.com).